It’s often said that Toy Story 2 & 3 are the only truly great Pixar sequels. What other sequels, you ask? Well, there’s the studio-tainting drudgery of the Cars series, the wet cloth that is Monsters University, and… much like the title character, I seem to have forgotten Finding Dory. Eventually, there came a beacon of hope on the horizon. A simple dot, on top of a curved tower, splitting its logo in two; The Incredibles were coming back. Oh, I know what you’re thinking; it’s a fun movie! The surface is incredible, funny and intelligent, like a perfectly tailored and put-together outfit in the completely wrong style. The Incredibles is one of my favourite films. Chances are, if you know me, I’ve raved about it; the way it seamlessly blends the tropes of both superhero and spy genres, bonding them to a strong family narrative core. It’s action scenes are exaggerated versions of common family events. Think of the showdown between our Fantastic Family and the terrifying Omni-bot; it’s a game of catch. Bob’s return to the superhero lifestyle is a mid-life crisis, Violet’s powers are a metaphor for her teenage shyness, and Helen’s elasticity speaks to her incredible capabilities as a mother. This original was bursting with life and whimsy, clever ideas sprinkled everywhere. The director Brad Bird has talked about how the sequel got pushed up a year, and if we’re being honest, you can tell. Sure the animation is impeccable, showing a studio at the top of their game; the lighting alone in the opening Underminer sequence is enough to take your breath away. And yet, there’s still something off about the story. Take, for instance, the best series of scenes in the first film, where Helen’s plane is attacked just as her children reveal themselves as stowaways. She screams down the line for them to abort their attack: “There are children on board!” The villain’s assistant is horrified, and yet Syndrome laughs on, as their father stares helplessly; his children’s lives out of his hands. Just like Helen tells her children later (surprisingly, they survive), the bad guys aren’t Saturday morning cartoons. They will kill them if they have the chance. 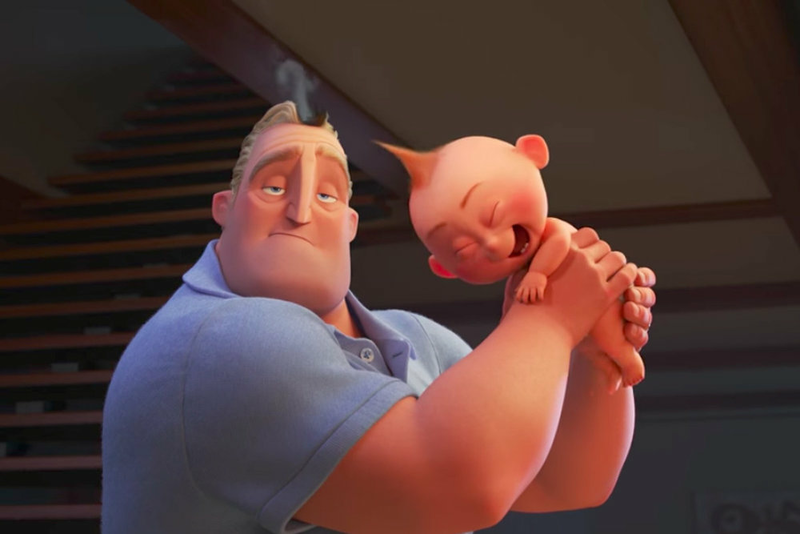 Incredibles 2, in comparison, is a Saturday morning cartoon. The children are never in real danger; the brainwashed Superhero team sent to kidnap them are buffoonish in their design and action, even when ruthlessly attacking. When they come face to face with their brainwashed parents trying to kill them, there should be an incredible amount of tension, a basic, instinctual fear. This is the crux of the entire film; but there’s no tension. This film doesn’t really belong to the kids. This section, the only one with real power, lasts for about 10 minutes and is easily hand waved away. Finally, something new is happening, superpowered kids on their own, with their parents set against them. But it’s too late. The film is almost over, and the solution happens so fast you barely see it. A reviewer is supposed to see a film for what it is, not for what it could be. We aren’t supposed to bemoan the potential, instead look for what already lies within. But I can’t separate myself emotionally from these films, and I can’t help but see the sparks of greatness within that it just can’t live up to. It pains me to say it, but while the film looks stunning, and the animation feels, well, incredible, Incredibles 2 is severely inessential, and thus, overrated.